Justice David Oladimeji of the Osun State High Court sitting in Osogbo has adjourned ruling on interlocutory order seeking the setting aside of the election of Senator Ademola Adeleke as PDP governorship flagbearer till tomorrow, Thursday. The matter is over issue relating to Adeleke's alleged non submission of his Secondary School leaving certificate. 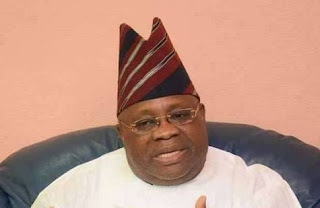 Two members of the PDP in the State have asked the court among other things to stop the Independent National Electoral Commission (INEC) from accepting the name of Senator Adeleke as the party’s candidate in the September governorship election. After listening to the submission of counsel to the plaintiffs, Barrister Olufemi Ayandokun, the presiding judge stated that he had to study the bulk processes filed by the applicants to be able to give ruling on the matter. He thereafter adjourned the case till tomorrow for ruling.